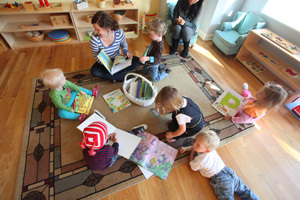 Who The Toddler Program at Children’s Garden Montessori is designed to meet the specific developmental needs of the 18 to 36 month old child. When Toddlers may enroll for either two, three, or five days a week in the 8:30 -11:00 AM session or the 12:15-2:45 PM session. The Toddler Program at Children’s Garden Montessori is designed to meet the specific developmental needs of the 18 to 36 month old child. The classroom is full of materials to support the toddler’s developing fine and gross motor skills, practical life skills, language and independence. It also provides ample opportunities to acquire and practice the skills needed to be a member of a community – primarily, respect for the environment, respect for self, and respect for others. In the Toddler Program, children are provided a supportive, nurturing environment in which their individual strengths and interests are allowed to develop and flourish. In doing this, we strive to encourage the children’s natural curiosity and set the foundations of a life-long love of learning.